Note: We assume that you have gone through the Basic Moving Cube Example and the Basic RPC Example before going through this example. 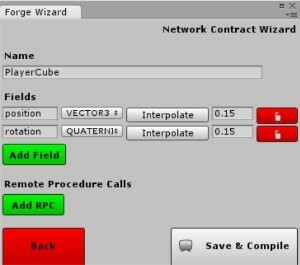 In this example we are going to create a simple cube to act as the player object. The "player" should be able to move their individual cube using the horizontal and vertical axis input. For this we will create a scene without any cubes in it, then when a connection is made or the server is created, we will spawn a cube "player" for the newly connected client or created server. When we use the Network Contract Wizard (NCW) we are actually generating a lot of network code based on what has been input into the editor fields, this actually cuts out a lot of work that you would have to do by hand. There is one class in particular that we want to extend from, this class name will be " PlayerCubeBehavior". The naming convention for this generated class is _____Behavior where "_____" is the name we typed into the NCW. Lets now create a C# file in Unity and write our basic game logic, we will name this file " PlayerCube". Since we are going to instantiate this object when a player connects, we will need a prefab that identifies this object. To quickly create a prefab that has a cube we will use the standard Unity process. Now that we have setup our player object it is time for us to create the prefab that will be instantiated when clients connect. With this we are prepared to setup our NetworkManager to support the new instantiation of the object. Now if you move around the cube in the editor, you will see the movements replicated to the client(s). If you move the cube around in the client(s) you will see the cube moving on the server. Our code has the cube constantly rotating so you will see them doing that as well.